Hailing from a distinguished Kansas political family, Nancy Landon Kassebaum made her own mark by winning election to the U.S. Senate and serving there for nearly two decades, eventually becoming the first woman to chair a major Senate committee. As both chair of the Labor and Human Resources Committee and a senior member of the Foreign Relations Committee, Senator Kassebaum earned a reputation as a determined and independent voice on issues ranging from Cold War policy to women’s rights. Nancy Landon was born in Topeka, Kansas, on July 29, 1932, into a family that emerged as a Midwestern dynasty. Her father was Alfred Mossman Landon, a successful oil man, two–term Kansas governor, and the 1936 Republican presidential nominee. Her mother, Theo Cobb Landon, was an accomplished pianist and harpist. Nancy Landon was born into a world of privilege, and national political figures dotted her childhood memories, including William Howard Taft and his family.1 “I enjoyed politics and public policy so much,” Kassebaum recalled years later, “that there were times in high school and college when I mused about becoming actively involved as a candidate.”2 She graduated from the University of Kansas in 1954 with a B.A. in political science and, in 1956, earned a M.A. from the University of Michigan in diplomatic history. While at the University of Michigan, Landon met Philip Kassebaum, who later pursued a law degree there. The couple married in 1956. They settled on a farm in Maize, Kansas, and raised four children: John, Linda, Richard, and William. 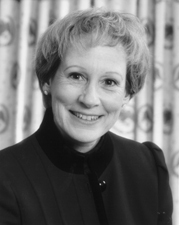 Nancy Kassebaum served as a member of the school board in Maize. She also worked as vice president of Kassebaum Communications, a family–owned company that operated several radio stations. In 1975, Kassebaum and her husband were legally separated; their divorce became final in 1979. She worked in Washington, D.C., as a caseworker for Senator James B. Pearson of Kansas in 1975; however, Kassebaum returned to Kansas the following year. Kassebaum received assignments on a number of prominent committees, including: Banking, Housing and Urban Affairs; Budget; Commerce, Science and Transportation; and the Special Committee on Aging. In 1980, when Republicans took control of the Senate, Kassebaum exchanged her seat on the Banking Committee for one on the prestigious Senate Foreign Relations Committee. She immediately was named chair of the Subcommittee on African Affairs, a position she held until the Democrats gained control of the Senate in 1987. She would remain on Foreign Relations for the duration of her tenure in Congress, and it became the focus of much of her energy. Though she knew virtually nothing about Africa she quickly became steeped in the region and U.S. interests there. Overall, Kassebaum earned a reputation as a moderate who supported the broad outlines of Republican budget and defense programs but remained independent on social issues. For instance, she supported a woman’s right to have an abortion. She also backed programs for international family planning, which again brought her into conflict with conservative Republicans. In 1992, she co–founded the Republican Majority Coalition, a group that sought to counter the rise of the religious right in the party. She resisted the feminist label, noting on one occasion that she thought of herself foremost as a “U.S. Senator, not a woman Senator.” She added, “It diminishes women to say that we have one voice and everything in the Senate would change if we were there.”12 In 1994, she voted for President William J. Clinton’s crime bill, a move which so enraged Republican Members that they tried, unsuccessfully, to strip her of seniority. Late in her final term, she also worked with Democratic Senator Ted Kennedy to push a bill through the Senate that would have overhauled the national health insurance system and provided coverage for people with pre–existing conditions. As a member of the Budget Committee in 1984 and 1987 she worked to enact a bipartisan deficit reduction plan. Beginning in the 101st Congress (1989–1991), Kassebaum served on the Labor and Human Resources Committee and, when the Republican Party recaptured the Senate in 1994, Kassebaum’s seniority made her chair of the committee. Her chairmanship of Labor and Human Resources during the 104th Congress (1995–1997) marked the first time that a woman had chaired a major standing Senate committee and the first time that any woman had headed a Senate panel since Margaret Chase Smith chaired the Special Committee on Rates and Compensation of Certain Officers and Employees of the Senate in 1954. Kassebaum also rose to chair the Commerce Committee’s Subcommittee on Aviation. In the 99th and 100th Congresses (1985–1989), she was named to the Select Committee on Ethics. In 1996, Kassebaum declined to run for re–election, citing the “need to pursue other challenges, including the challenge of being a grandmother.”13 That year she also married former Tennessee Senator Howard Baker, Jr. Kassebaum worked briefly as a visiting professor at Iowa State while she and Baker divided their time between homes in Kansas and Tennessee. In 2001, Kassebaum was named a co–chair of the Presidential Appointment Initiative Advisory Board which made recommendations to the Senate Governmental Affairs Committee on how to streamline the presidential nominee appointment process. Later that year, when Howard Baker was appointed U.S. Ambassador to Japan, Kassebaum accompanied him on his assignment to Tokyo. 1Paul Hendrickson, “His Daughter, the Senator–Elect from Kansas; Alf Landon Aimed for Washington, Now Nancy Kassebaum Is Going,” 30 November 1978, Washington Post: G1. 3Current Biography, 1982 (New York: H.W. Wilson and Company, 1982): 191. 9Marcy Kaptur, Women of Congress: A Twentieth–Century Odyssey (Washington, D.C.: Congressional Quarterly Press, 1996): 198–199. 10Interview, 4 October 1979, Working Woman: 62. 11Almanac of American Politics, 1994 (Washington, D.C.: National Journal Inc., 1993): 491–492. 12Karen Foerstel, Biographical Dictionary of Congressional Women (Westport, CT: Greenwood Press, 1999): 144. 13“Senator Kassebaum Says She’ll Retire in ‘96,” 21 November 1995, New York Times: A17. Papers: 1979-1996. Ca. 659 cubic feet. Records of service in the Senate including alphabetical, general and department (federal agency), subject, grant notification, constituent service, and education subcommittee-related correspondence; newsletters, news releases, clippings, and other press files; scheduling and other administrative records; speeches; files of legislative assistants on a wide variety of topics; and records relating to daily activities, sponsored legislation, and voting record. Major subjects represented in the papers include women's and children's issues, foreign policy and African affairs, education, and health care reform. Finding aid. Papers: Corespondence in Iantha Powrie LeVander papers, 1947-1990. Finding aid. Kaptur, Marcy. "Nancy Landon Kassebaum." In Women of Congress: A Twentieth Century Odyssey, pp. 195-203. Washington: Congressional Quarterly Inc., 1996. Kassebaum, Nancy Landon. "To Form a More Perfect Union. "Presidential Studies Quarterly 18 (Spring 1988): 241-49. "Nancy Landon Kassebaum," in Women in Congress, 1917-2006. Prepared under the direction of the Committee on House Administration by the Office of History & Preservation, U.S. House of Representatives. Washington, D.C.: Government Printing Office, 2006. Marshall-White, Eleanor. Women, Catalysts for Change: Interpretive Biographies of Shirley St. Hill Chisholm, Sandra Day O'Connor, and Nancy Landon Kassebaum. New York: Vantage Press, 1991.